Find yourself a vacation that&apos;s the perfect blend of adventure and you. It might sound counterproductive, but sometimes you have to slow down to get your heart really pumping. In SLO CAL, every moment is reserved for what truly matters: from paddleboarding past otters and harbor seals to ziplining hundreds of feet above the oaks before sipping fabulous wine. Because whether you’re galloping full speed on horseback or enjoying the slow rock of a hammock, it’s all about savoring the small stuff and taking big leaps into the wild. That’s right. Get yourself a vacation that can do both! 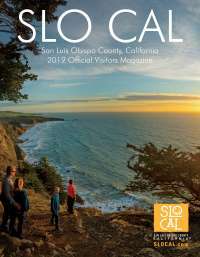 Check out all of the awesome ways to achieve your ideal vacation on California&apos;s Central Coast. Hold your breath and hang on. Ziplining in SLO CAL is unlike anywhere else in the world, thanks to world-renowned wine and oak-studded scenery. Not only will you soar high above forest and vine at Margarita Adventures in Santa Margarita, you’ll end your multi-line run with a glass of Ancient Peaks cabernet sauvignon. Seeking greater relaxation? End a positively high-flying day with a long hot soak at famous natural sulfur hot springs in Paso Robles or Avila Beach. If you’re a cyclist, you’re always looking for that next, epic ride. Good thing SLO CAL is home to dozens of unique trails where traditional bikes and mountain bikes are warmly welcomed. Ride the Bob Jones Trail, which runs from Avila Beach to the sea; traverse Paso Robles diverse wine trails offering up views of vineyards, wildflowers, wildlife and wineries; or take to the coast, where Highway 1 stretches from Ragged Point, down to Hearst Castle and right by the charming hamlet of Harmony, to the Morro Bay Embarcadero and beyond. Cheers to a road well traveled with a well crafted cocktail at Il Cortile, La Cosecha, Luna Red, or KROBAR. Start your engines! There’s only one place in California where you can put key to ignition. Consider the Oceano Dunes State Vehicular Recreation area your need-for-speed playground, where wheeled toys and trucks of all sorts kick up sand under sunny skies. Drive your ATV across the beach, light a bonfire and make s’mores, or park your vehicle and stay a while. After all that sun, sand and wind, you’ll be ready for a spa treatment. Try the Madonna Inn Spa, where after your massage or facial, you can relax in a heated pool or soak in your choice of two luxurious hot tubs. Thanks to a long growing season, SLO CAL is flush with fresh produce all year round. Sure, you can stop by a farmer’s market (unfolding weekly in just about every town across the area), but wouldn’t you rather get your hands in the dirt? Book a rugged agritourism adventure and see where happy farmers come from. Stepladder Creamery offers up tours of its hilltop Cambria goat farm, the Groves on 41 in Templeton is home to acres of olive trees, and Talley Farms in Arroyo Grande showcases a working vineyard, winery, and farm. Unwind with an unbelievable sunset in quiet Shell Beach or Cayucos, where pink and orange-skies are often heightened by sea life sightings. Adventure like you mean it. Sure, you’ve kayaked—but have you ever rowed inside an underwater cave? Explore this rocky, wet terrain at Pismo Beach’s historic Dinosaur Caves Park and know you’ve experienced one of SLO CAL’s most thrilling hidden gems. Afterward, you’ll want to dry off, rest your arms and stretch those legs. Stroll fun-loving Pismo Beach, where you can dig into iconic chowder at Splash Cafe, walk a bustling boardwalk and pier, or shoot some pool with your best buds. If your idea of fun is galloping horseback along glistening tide pools while the sun sets on the water, you’re in luck. Although this might sound like a fairytale fantasy, its just a day at the beach at Montana de Oro State Park, located in scenic Los Osos. Feel the fresh salty air on your face as you trot along some of SLO CAL’s most coveted coastline. End your dreamlike evening with an entertaining, family-friendly show at the Great American Melodrama in Oceano or a play at the SLO Repertory Theatre. Reach farther and sweat harder. Test your stamina and strength at The Pad Climbing gym in San Luis Obispo, where you’ll work out every muscle in your body (and especially your arms and core). What’s more, rock climbing is a fun activity for the whole family with challenging walls for every age and skill level. Cool down and cozy up with a farm-to-fork dinner featuring some of SLO CAL’s most delectable seasonal flavors. Choose from a long list of fresh eats, including Thomas Hill Organics, SLO Provisions, Sidecar, Mason Bar and more.